Warner Bros. inked a deal for Lego to make more playsets and figures of the settings and characters of the DC Universe. The license for characters and likenesses of the DC Universe are a hot commodity, one that has been lucrative for both Warner Bros. with its film adaptations as well as videogames. One of those games, Lego Batman has sold more than 12 million copies since it came out in 2008 (admittedly because it was a pack-in game for the Xbox 360) and WB has decided to extend its relationship with Lego. Thanks to this new deal, the Danish brickmakers will now be able to use the entire catalog of DC comics for toys and playsets. The first line will include 13 characters from the DC universe including Batman, Superman, Wonder Woman, the Joker, Bane, Harley Quinn and Lex Luthor which will launch in January 2012. "This partnership gives builders a chance to recreate the characters, vehicles and worlds of some of the most iconic super heroes, so they can relive the action and even customize it, a proven and winning formula in Lego construction," said Jill Wilfert, VP, licensing and entertainment for the Lego Group. 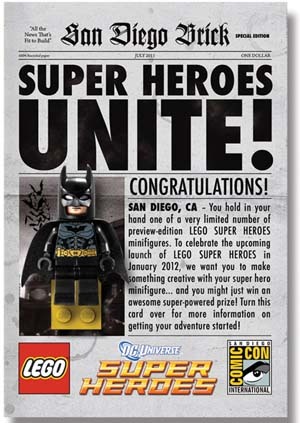 Attendees at San Diego Comic Con will get the first glimpse of this new union with 3,000 exclusive Batman and Green Lantern minifigures given away from the Lego booth. If you're headed to SDCC, be sure to grab a Batman or two for me.